Peacefully grazing on the grass. A small group of red deer graze peacefully on the grass next to two small birch trees. Large areas of the moorland are covered in this thick yellow grass, looking almost straw-like during the summer months. Towards the beginning of Autumn the colour can deepen to a deep yellow-orange, with patches of red tipped grasses further turning the moor to a vibrant orange colour. The group of deer all look up as if startled by something to their right. Now that the heather has finished flowering and now developing light coloured seed heads, the heather is also turning the moorland a rich brown. With the trees also starting to turn, early Autumn is a very rich and colourful time on the moors. This time of the year suits the red brown coat of the deer perfectly. 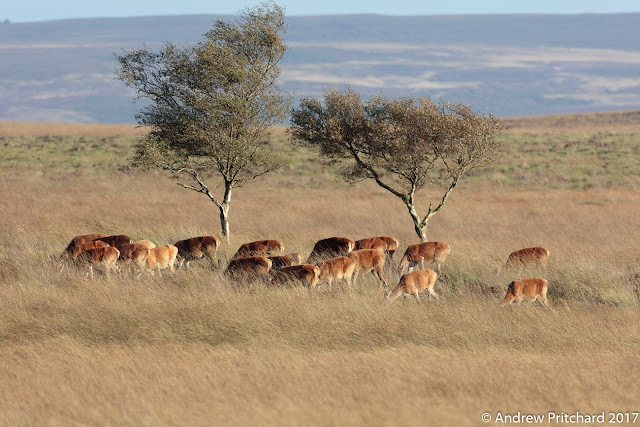 The group of red deer suddenly take off running through the long grass. In the background the red tipped variety of moorland grass can be seen, turning the landscape quite a deep shade of red. The coat of the deer is somewhere in between the yellow of the straw-like grass, and the red-tipped grasses, making them well camouflaged in the right areas, and if lying down! A lone calf looks lost. A lone calf stands in the grass and bracken looking lost. 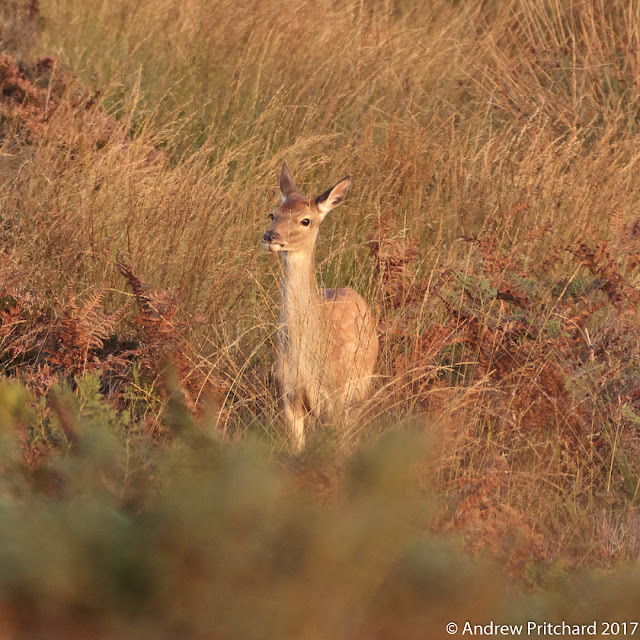 In the evening sun the deer's coat is a very similar shade to the grasses, and would blend well with a mixture of grasses and brown brackens. Perhaps the mother is nearby, but can't see her calf due to it's good camouflage in the surrounding flora. The calf re-joins it's mother and another hind. The calf re-joins it's mother and another hind to walk through the heather, it was not so lost after all! The hinds appear to be walking with the calf between them now though, perhaps to ensure there is no more confusion or getting left behind for the calf. A calf stands close to it's mother, who looks confused. The calf is looking to the right, whilst the wind ruffles it's hind quarters, so perhaps its the wind that is confusing the deer. Any sounds of possible predators would be hard to distinguish from the noises made by the wind blowing through the grasses and shrubs. I'm eating grass, what are you doing? A young calf has a piece of grass sticking out of it's mouth as it stares forwards. Sometimes vision is the best method for determining threats, but sound is an important factor also. Any non-natural sounds, such as a camera strap buckle clinking on a camera body can spook the deer, so it is important to secure any loose items before attempting to stalk any deer. The calf is still staring towards the camera, which is with the author on the footpath near to the deer. At times the deer can be quite close to human paths over the moor, and it appears they are quite used to people such as dog walkers, joggers or cyclists moving through the landscape. 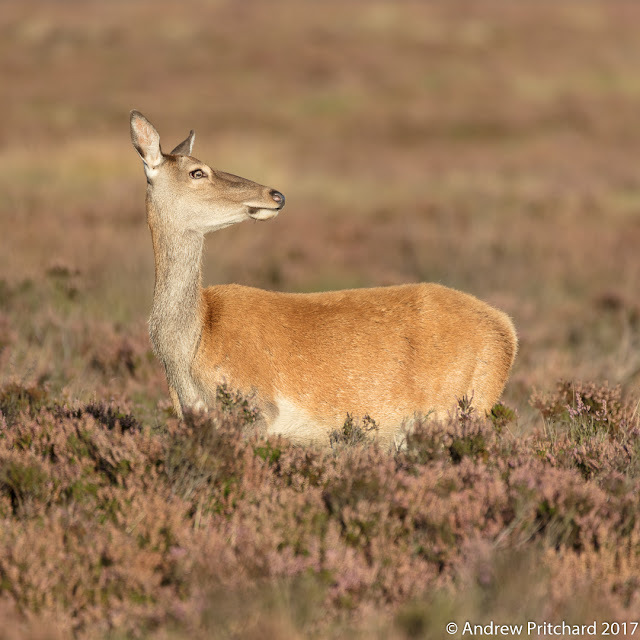 When a human stands still for too long though, it can make the deer nervous, so it is best to keep moving to minimise disturbance. The calf looks to it's left, as if checking something. 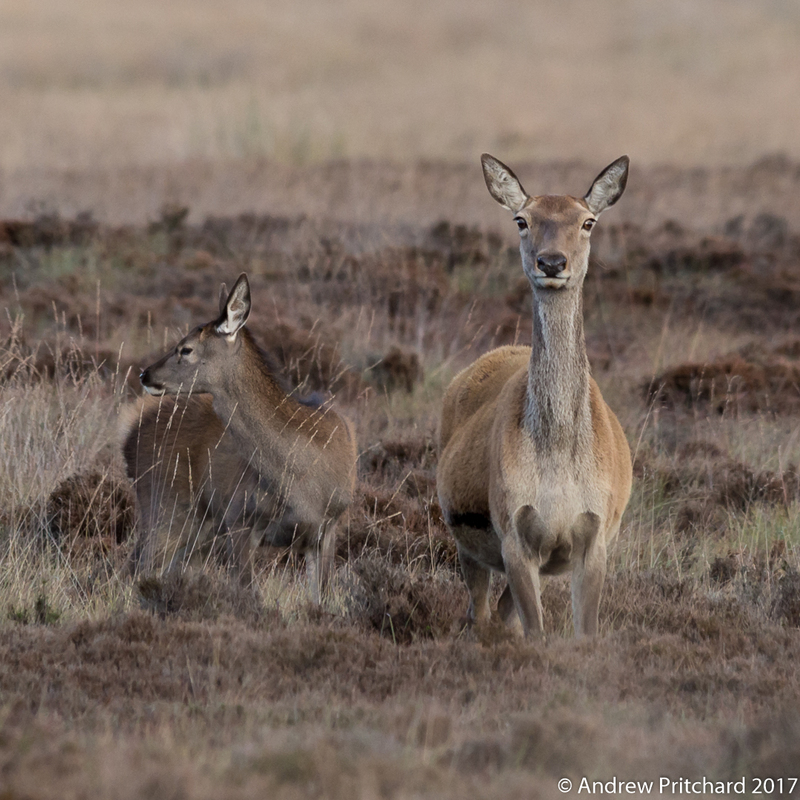 There is a young stag nearby who seems to be associated with this small family group, and it would appear they are now taking cues from the stag on when to move. During the spring and summer the hinds and therefor the groups of deer are much more wary of humans. 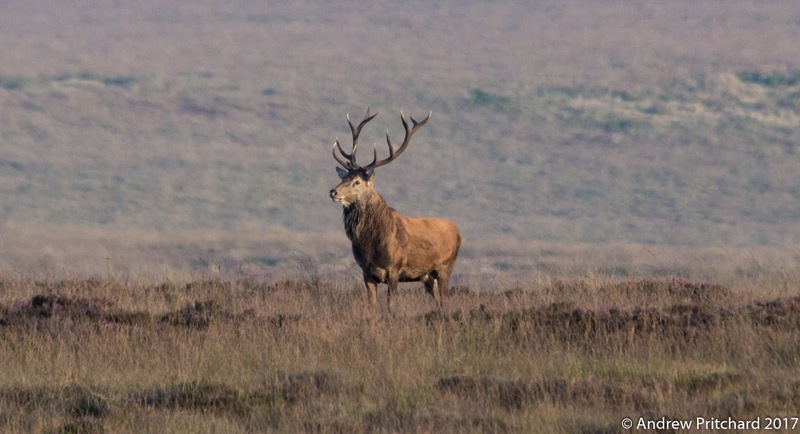 Now in early Autumn it is close to the rut, and stags have appeared in numbers on the moorland, and the deer are not so skittish. The hind also looks for help. The hind, probably mother of the calf, also looks for assistance. She is also looking to the young stag for guidance on when to move on. 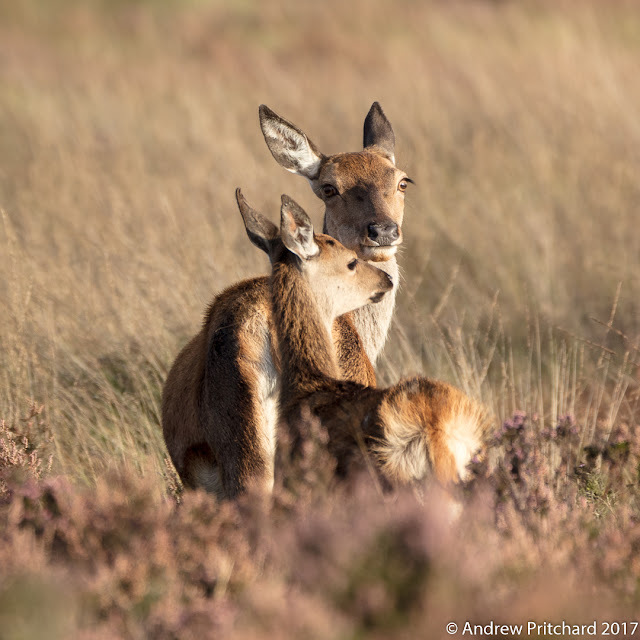 Without the presence of the stags at this time of year, the deer would clearly be more wary, with the young calf and the hind not totally at ease. The young stag is not concerned about anything. 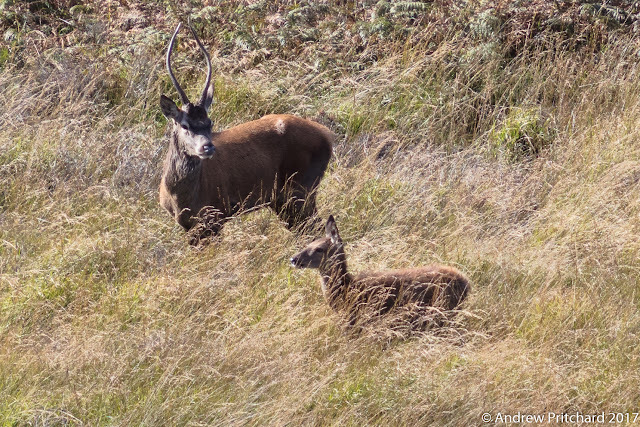 The young stag is not concerned about anything, looking towards the hind and calf, who still seem to be looking to him for support. Both the stag and the young calf with him are looking towards the other two deer, perhaps wondering what they are doing staring at them! He is certainly not worried by anything else, but may soon become concerned by their behaviour. 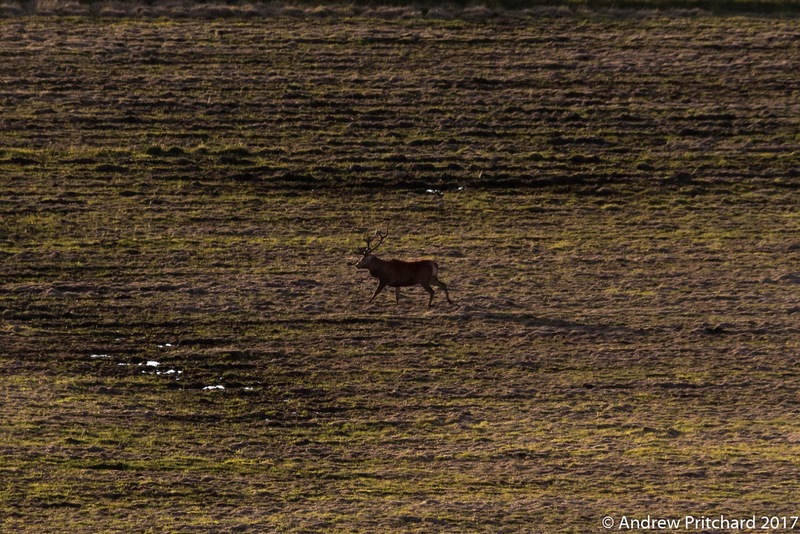 A lone stag patrolling the flat lands. Elsewhere a lone stag patrols the flat lands, probably looking for rivals to challenge. 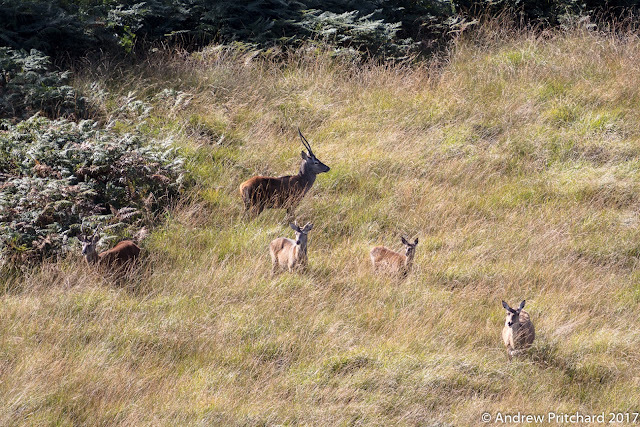 Some stags have not managed to become part of a group of other deer yet. 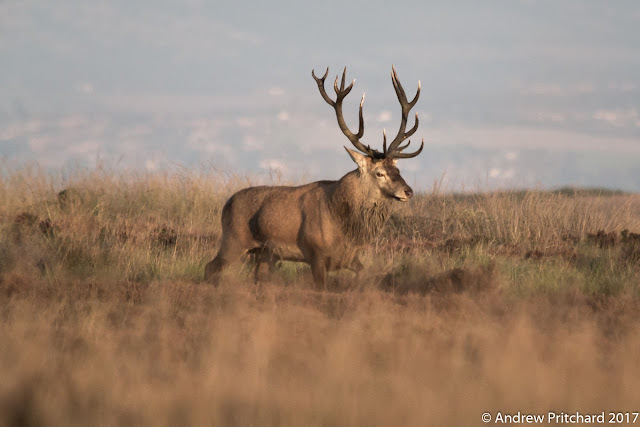 Stags such as this are looking for hinds to gather into a harem ready for mating, and spend the next few weeks defending their group from rivals, often leading to fights. 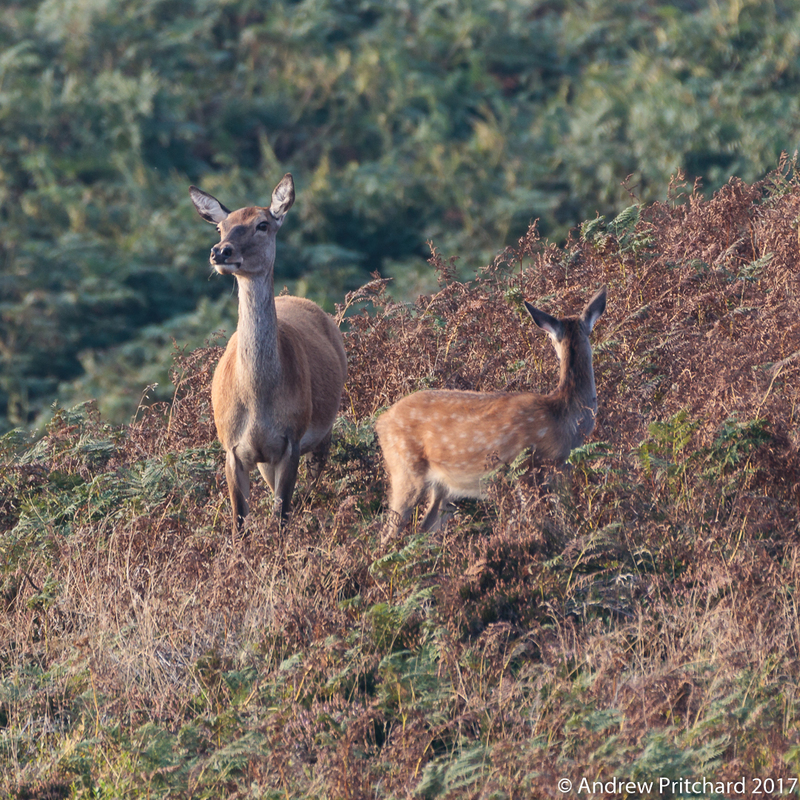 A hind and calf are waiting in the bracken for something. Perhaps they are avoiding a stag nearby. 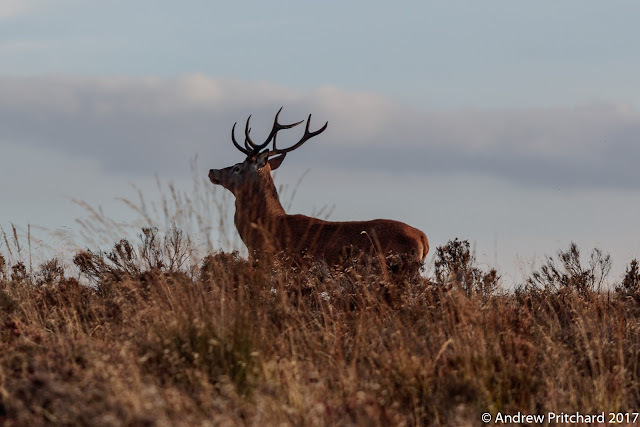 It is not unknown for other deer to get injured accidentally during the rut when two stags fight. 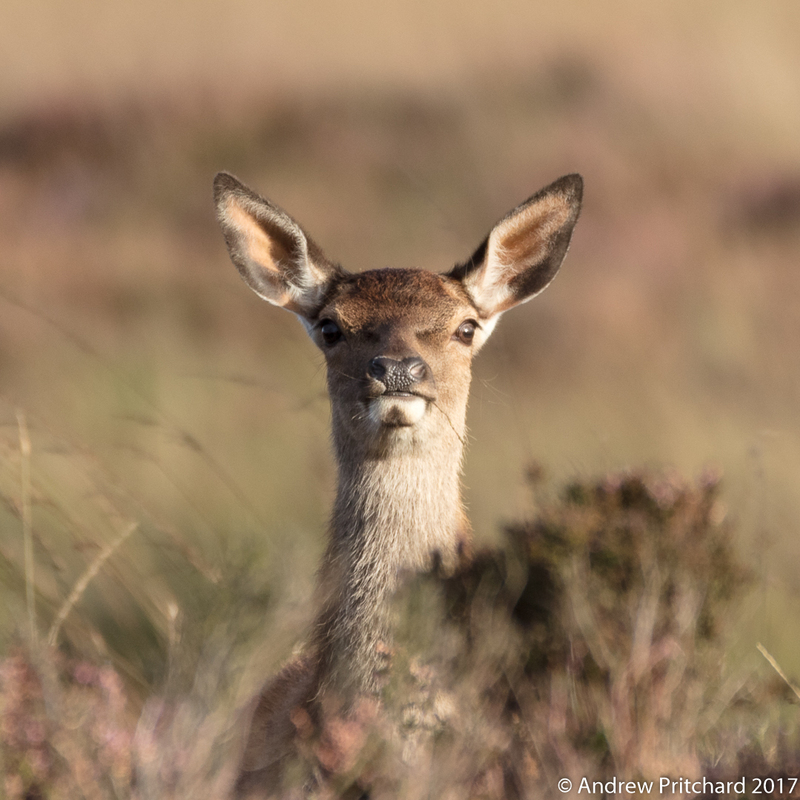 Such large animals sparring with each other can be dangerous, and the hinds with this years calves seem to try to avoid any such activity, often keeping well away from any dangerous areas. 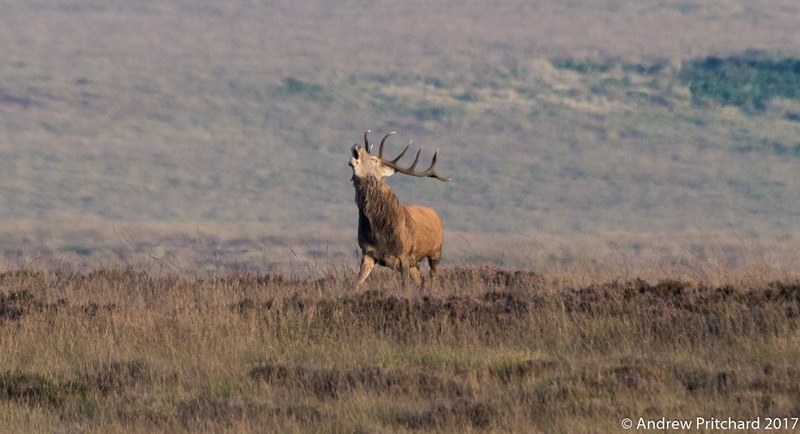 A roaring stag on the moors. A stag roars his challenge across the moors, perhaps attempting to gain control over one of the flatter areas of the moor, or just signal his presence to the other deer. 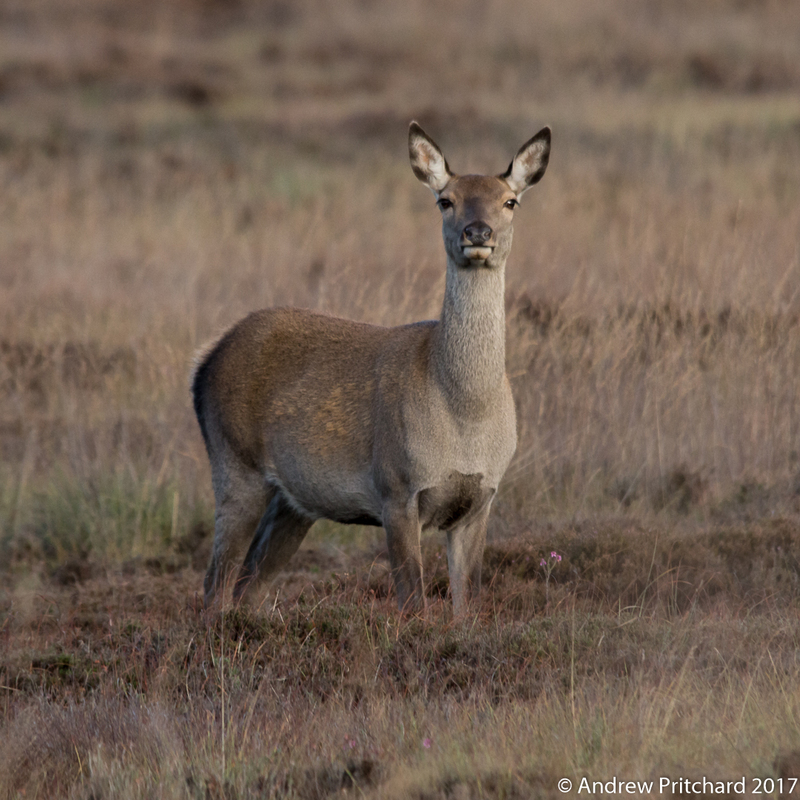 Some stags already have groups of hinds under control, waiting for them to be ready for mating, others have a more difficult time. 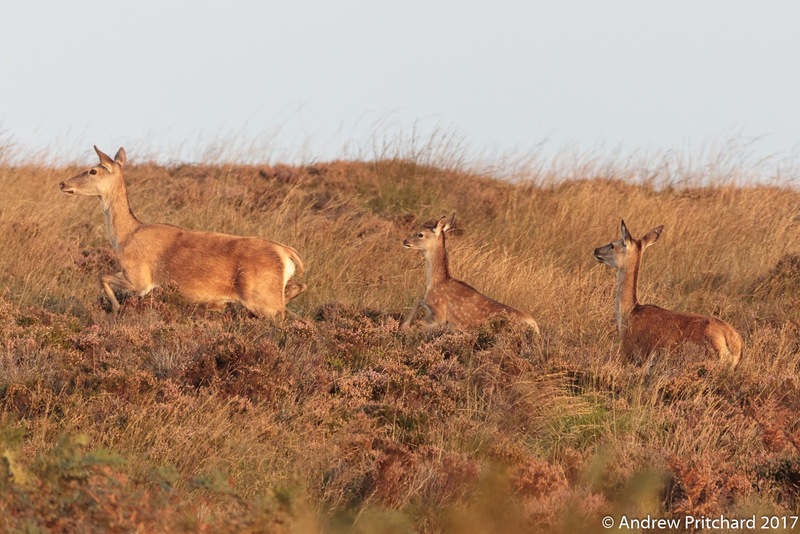 They must fight a more dominant stag for access to the hinds under his control. Taking a break from roaring. The stag takes a break from roaring, looking quite calm and majestic. This specimen has six tines per antler, making him a well developed royal stag with twelve tines in total. He also has developed a large shaggy mane covering his entire neck area, which may provide some protection during fights. He may be a maturing stag, still to grow further tines, or be aging and past his prime when the number of tines begins to fall again. Head raised, the stag opens his large mouth and roars again. The stag however probably has no thoughts on his position as judged by the number of tines on his antlers. 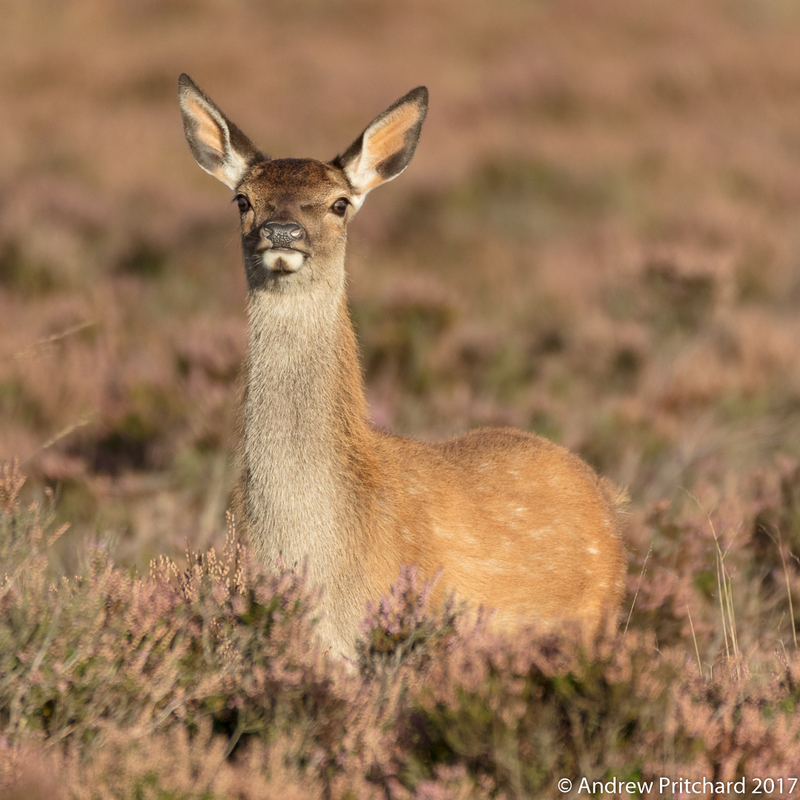 It is said that hinds prefer a stag with a deeper vocalisation, which may indicate a larger fitter body, and the number of tines must reflect a stag's overall fitness. Growing antlers requires a large amount of energy, as does gathering and keeping a harem of hinds! 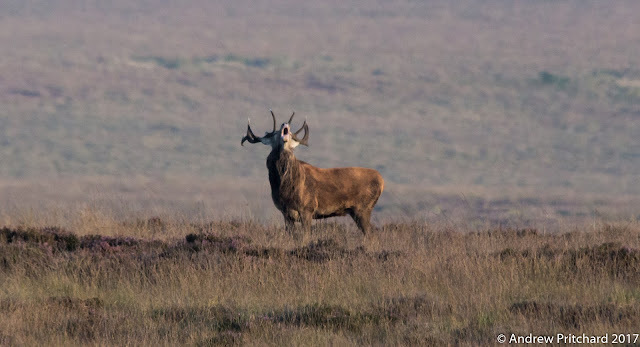 This stag appears to have had enough of roaring for the moment, and wanders across the moor in the light from the evening sun. He appears to have quite a light coloured face, and also has possibly sixteen tines to his antlers. That is a large number of tines, and may indicate he is quite old for a red deer, yet still going strong! Age may also be reflected in his whitish face - perhaps he is going the red deer equivalent of grey. 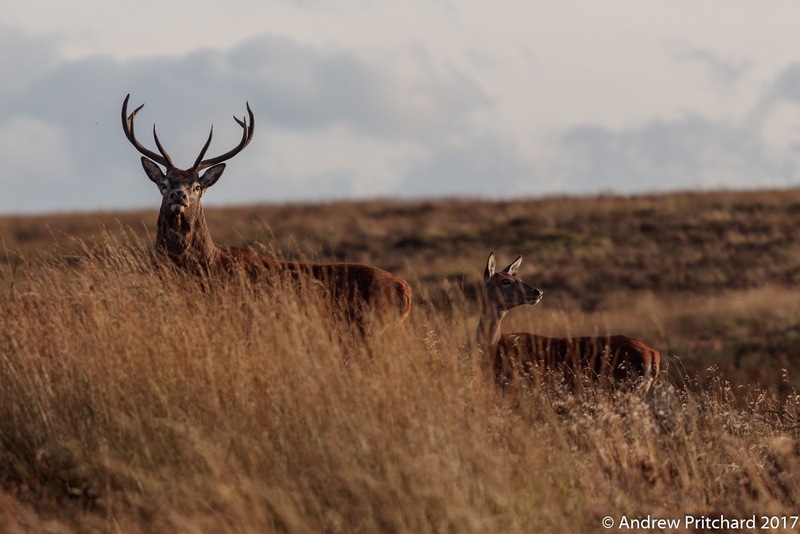 A hind and calf walk through the deep orange coloured moorland grass. 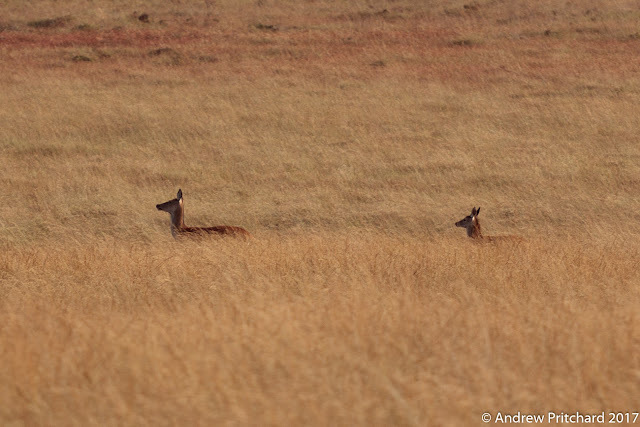 A hind and calf are walk through the deep, orange coloured grass. The grass on these moorlands frequently makes me think of savannah, as does the landscape in general. It is a large area of grass heather and shrubs, including some small trees too, of about twelve square kilometres or more. It is easily possible to gaze out across the moorland for six kilometres or more, and see only the occasional field or road. A stag and hind cross the path together, standing on the ground above the path to check where the other deer and humans are. They are part of a group of deer moving up from the woodlands below onto the higher moorland to graze. The deer seem to like being in the wooded areas at night, and can often be seen crossing up onto the moors in the early hours, although may do so at any time, as here in the late afternoon. A stag walks serenely out onto the moors after crossing the path used by humans. The slope up from the woods is largely covered by bracken, which prefers a well drained soil and can be seen covering the slopes in bright green foliage during the summer months. In September, it is already beginning to die back, and will soon add its own deep rusty brown of dead fronds to the Autumnal scene. This is where the good grass is. 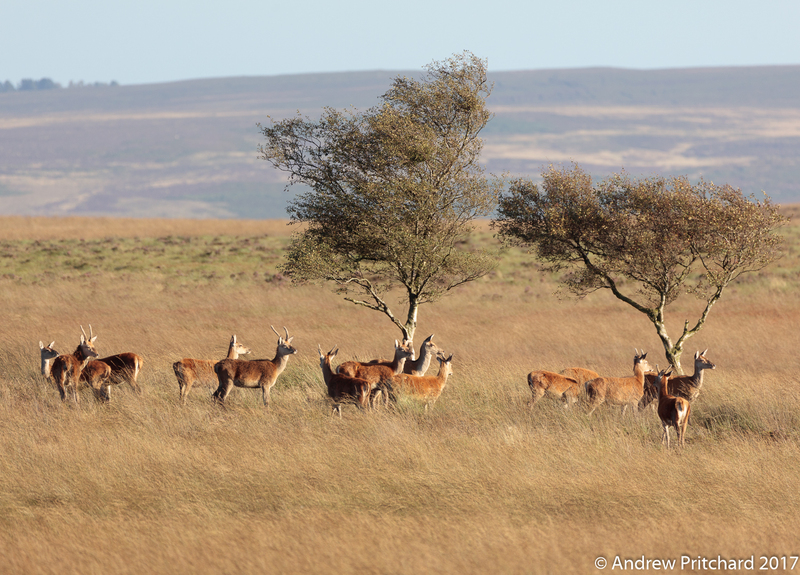 A group of deer graze on the thick moorland grasses. Lower level woodland can be seen in the background, which may be one of the deer's favourite haunts when they want to disappear. At times like this during the beginning of the rut, they tend to be more concerned with their own business. They are much easier to see such at these times as here, in larger numbers on the moorland. A hind checks out what the humans are doing, while her calf looks unperturbed to it's right. The calf seems to have a darker coat than the mother, even down to the chest and neck fur. This may indicate a male calf, but it is very hard to tell male and female apart when they are so young. The calf appears to have something of a mane, especially down the back of the neck. It also has a short looking nose, perhaps another indicator of maleness. Deer next to small purple flower. 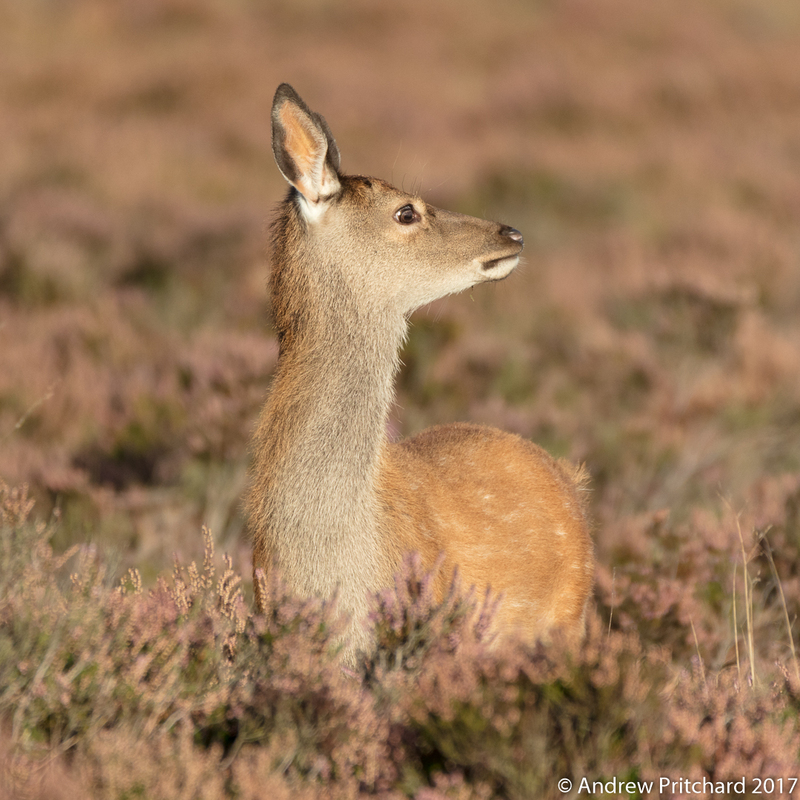 A hind stands still next to a small purple flower, her hooves hidden in the heather. The two hinds pictured in this and the previous image have quite different patterns in their chest fur, but are similar ear fur shape. Is this another way to differentiate between animals? A young stag with long unbranched curved antlers stares intently at a younger deer. It is uncommon to see antlers such as this, with one long unbroken tine per side. Brockets or males in their second year will often have single tined antlers as their first set, but much shorter than this. 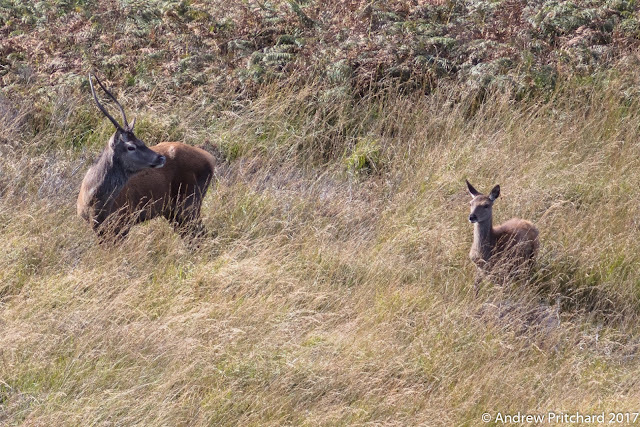 The young stag is still very interested in the younger deer as it walks through the deep yellow grass past him. The odd antlers are well displayed here, as is the developing mane on the front neck of the older deer. Perhaps the beginnings of the rut are disturbing this fellow, and he see the younger deer as a rival already! The intent stag loses interest as the other deer become concerned what is happening nearby, and nothing untoward happens. It would not be surprising to see arguments developing, involving even younger males as here. 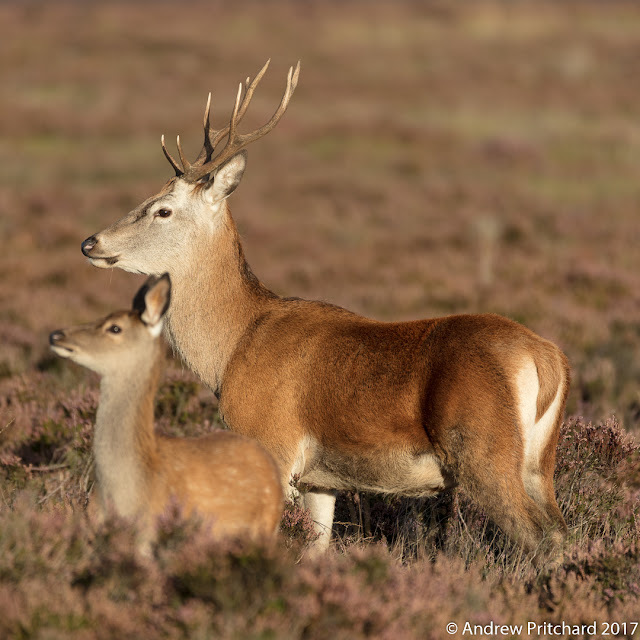 We have already seen stags boxing with each other in the blog page for May, so it is clear that males together can be a volatile mix!